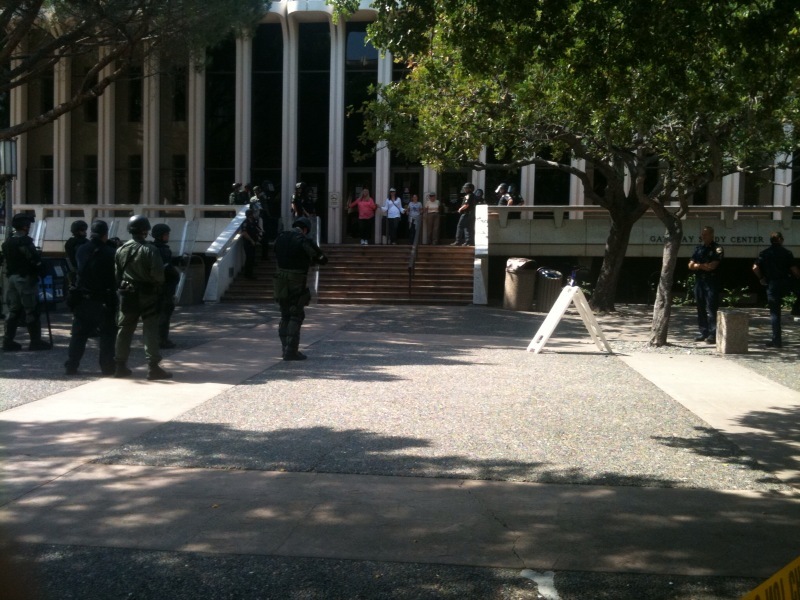 IRVINE, California – We have just received word from our comrades at UC Irvine that as of 3:00pm today, UCIPD and Irvine PD are running an anti-occupation operation at the Gateway Commons Study Center at UC Irvine. 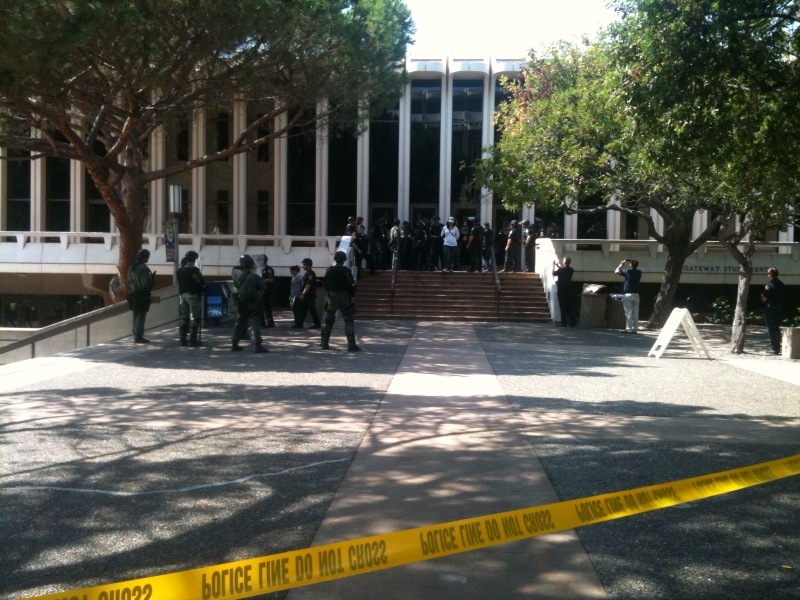 Campus and/or police staff are pretending to be student protesters and are simulating the occupation of the Gateway Commons building, while police are in full SWAT gear and Irvine PD are dressed in olive green and brown military fatigues. The “protesters” reportedly are throwing water bottles at police. The UCI Press Office would not comment when called. Gateway was the site of a brief—but failed—occupation attempt on March 4, 2010, following a rally of nearly 1000 students that left campus and blocked Campus and University Drives. 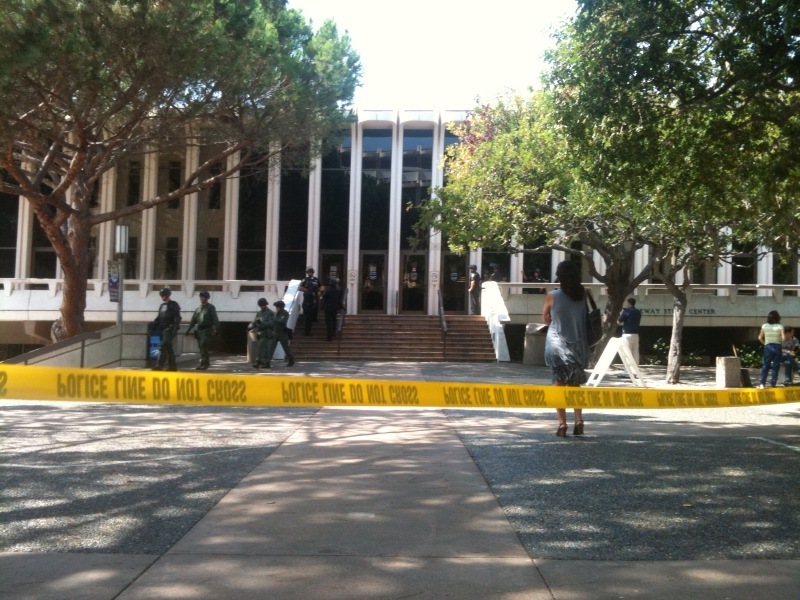 I am on campus today and I am currently witnessing a protest simulation complete with UC Irvine SWAT teams, police, fake protesters, and the fire department. It looks like a really strange farce. They are “protesting” outside of Gateway in a “closed” off area around the library. The protesters are simulating what “protesters” act like, confronting officers, yelling, and running around the building with picket signs and megaphones. There are also photographers and camera men “capturing” the event . . . . 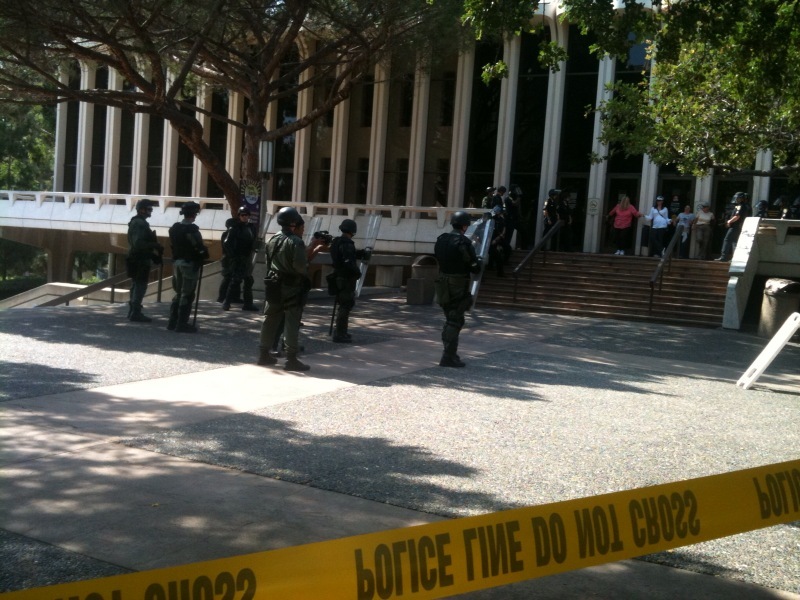 There were a lot of SWAT on campus and I thought they had a real emergency going on. It seems it has been going on for over an hour. The protesters even have fake “speeches” and chants. The fake protesters did NOT look like UC Irvine staff, they are not very good actors (or smart ones), and you can tell that they were working for the police. There are some middle-aged people, a couple of protest “leaders” and designated lawyerish and “first-aid” folk with megaphones. There were also a couple of young people, pretending to lock box themselves together inside the Gateway Center, three young men who look like 20-something-year-old college “students.” The simulation was thorough, the police and swat teams made several rounds around the building before entering the Gateway Center, even going on the megaphone to deliver an order to disperse. When the police “asked” the fake head protesters “Why are you doing this?” they responded “Oh you know, I don’t want to pay to pee. We want free books. Fees.” There was some more chatter, but I could not hear them very well and it was quite obvious that the whole protest message is a joke. They also said “We want freedom, justice,” “Hell no we won’t go!” yelled “Pigs” at the police, “Come on this is a protest!” “We want free stuff,” “UCI! UCI!” “USA! USA! USA!” and “We don’t like the guy in the green!” They also threw several water bottles at police in riot gear . . . . The protesters also said “Join us, join us!” and four middle aged women “chained” themselves to the entrance of the Gateway building, where occupiers were “locking” themselves in. They then proceeded to “break” through the “locks” and ties, with firemen on hand to remove the fake protesters. There were at least ten Ford beigeish cars parked in the back of the library on ring road, along with a SWAT team paddy wagon (Irvine SWAT), and three fire trucks. These SWAT appeared more militarized, with head-to-toe body armor, high black combat boots, shields, long black batons, rubber-bullet rifles, and face shields. This entry was posted on 15 September 2011 at 2:28 pm and is filed under News, UC Irvine. You can follow any responses to this entry through the RSS 2.0 feed. You can leave a response, or trackback from your own site.